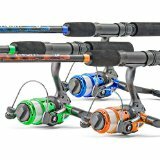 A Beginner's Guide to Fishing - Begin Prepping Now!! I will begin by saying that I am not a great fisherman. I have a water problem. If I am that close to water, I would rather swim than fish. But this is a prepper website, and I think it is extremely important that people be able to care for their families if a disaster of some sort happens. There are waterways all over the country that have fish available… if you know how to catch them. Fishing is an activity that requires some basic knowledge, some basic tools, a little luck and a lot of patience! I am not going to try to explain the details of fishing, because fishing is site specific. It will be different for the fish in your region. Contact your local Fish Wildlife and Parks ranger and identify the fish that are in waterways within 100 miles of your home, and any secondary location you might go to. There are FWP-type offices all over the country. Different states have different names for the department. FWP is Montana’s version. They can help you even if you live in an urban setting. Please realize that if you are in a large city, and you tell FWP that your want to learn to fish for the fish in the city park, they will not help you. Ask for their help identifying fish that are native and imported. Ask if there are any opportunities to fish close to your home. They will be happy to help. When you are ready to go fishing, FWP is the group that issues fishing licenses and makes the rules, which also vary greatly depending on the number of fish in a body of water. There are thousands of great fishing books around. I would try to find a local publisher with ideas for fishing in your area. There are some fish that live in water from Canada to Mexico, but the ways of locating and getting them on a line are way different depending on elevation and water temperatures. Local insight can be invaluable. It is also going to give you an idea what equipment to buy. Fishing is a lot like car stereos…You can get good functional tools that are reasonable to buy, or you can go crazy with top end toys. Both will get the job done, it just depends on the cash in your pocket. At a minimum, I would get some fishing line and a few hooks that are the right size for your area. Put these items in your emergency bag. At least you will have something to work with if the need arises. Hooks, line and poles are all weight rated. The rating on a line is the pounds of force that will break the line. In the same way that a squirmy 10 lb. baby is like struggling with 40 lbs of force, a 2 lb fish flailing about can expend a lot of force on a line. If your research shows that most fish in your area are less than 3 lbs, 10 lb setup should be ample. That accommodates the fish and the fight. If you have two size categories of fish in your area, I would recommend getting a pole for the heavier fish, then get 2 sets of hooks and line (one for each size.) In my area, there are a lot of creek fish that are under 1 lb and river fish that can run up to 10 lbs. Obviously these two fish need different hooks to catch them. 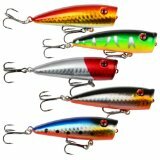 There are more lures and baits than you can imagine. If you are interested in learning, folks in a bait shop would love to help you figure it all out. If you just want the basic version, fish eat what lands in the water. If you look at the bugs on land in this season, and find a lure that is similar in size and shape, that will flop around as you pull it through the water…you have a good candidate. That is why a lot of weekend fishermen, pick up bait on the way, or catch bugs when they get there. If you build a small tackle box, get a couple of lures that are season specific, and some general purpose all summer ones. Don’t get sucked into the prettiest lures. Some of them are works of art, but if it looks like a jellyfish off the Pacific coast, it is not likely to look like food to a mountain brook trout. Realize that fishing is a hit or miss deal. If there is a storm coming, and the barometer is changing, fish will hit anything that resembles food. If the barometer bottoms out, the fish all hide at the bottom until the storm is gone. You aren’t gonna catch anything but a cold. Fishing is a skill that adds one more possibility for feeding your family. Go out, use the equipment you bought, make sure it works properly. If something is defective, or you don’t understand how it works, you can get some help in figuring it out. You don’t want to have an emergency, open up the pole set and realize the pole had a hairline crack and have the reel fall off in your hands. Make sure that you know what the local fishing regulations are and that you have purchased the proper fishing license. In most places, a fishing license is good for a year, but the number of fish you take per day and from where changes, according to water conditions. So you have to check before each trip, for updated info. Go out periodically, so that you get comfortable with the motions of fishing. If you understand the mechanics of fishing, it will become automatic pretty fast. Then you can relax and enjoy the weather and the birds…even if you don’t catch a fish. If you are tense and twitchy, you will not catch anything because every movement is agitated and that will scare fish away. Hopefully, you will go out and catch a whopper your first time out. But you might not. 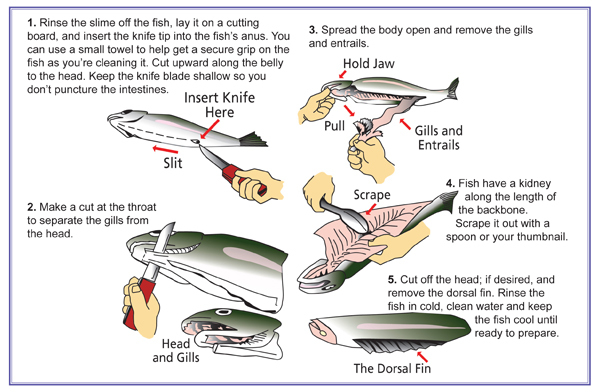 You still need to know how to properly clean a fish. People shy away from cleaning fish, but it is very similar to cleaning up a chicken. Kinda slimy but not too bad. Most fish, you make a single cut on the belly from the chin to the pooper, spread the ribs and most everything falls out. If you do this part over a bucket, the mess is contained and easy to get rid of. Rinse the cavity out with clean water and visually check to make sure you didn’t miss anything. 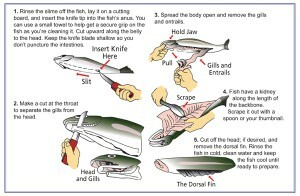 That’s all there is to gutting a fish. Many smaller fish can be cooked skin and all on the grill or in the oven, wrapped in foil. When the cooking is done the skin and bones are easily removed. Larger fish are gutted the same but cut up for cooking a bit differently. I will leave that to your research on your local fish. If you don’t catch your own fish, buy some fish that is fresh from a local market. Look how they gutted it, and get the feel of descaling and de boning. It is a skill. The first couple times, you may feel clumsy but keep doing it. It is a skill. Skills save lives. Fishing is a fun and relaxing hobby for many people, and there is no reason it can’t be enjoyable for you too. But even if it is not something you are into, make sure it is a skillset you are fluent in. You may not like public speaking but if your job requires it you learn to do it passable well. Apply the same diligence to fishing. It is a set of skills and tools that could provide food that sustains your family in a time of need. That is no small thing. Do You Have a Good Sleeping Bag? Hello, Enid. 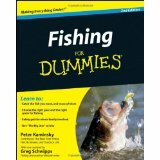 I really enjoyed reading what you have to say about Beginner’s Guide to Fishing. I used to fish tournaments in Florida, large mouth bass. But my disability started in 2003 and I haven’t been fishing since. My largest large mouth bass was 14 lbs. 10 oz. and an 11 pounder was a through back. My husband has been after me to go fishing, but it’s hard for me to get around. I loved fishing and would love to get back to it. Your explanation is great and anyone can do it. You just have to practice. Thanks for sharing! I am very impressed…a 14 lb fish is huge! That would have to be a week of suppers. I am sorry you haven’t been out lately. I hope you can figure a way to go out, even if it’s not the same as before. A day on the water with people you love is so much fun, even if you aren’t drowning worms! This article is well written and pleasant to read. Fishing is such a relaxing activity. Especially on a summer afternoon at a river or pond, passing the time by waiting for a catch, chatting away, or doing some contemplation. When is the best time to fish where you are? What did you mean by the amount of fish per day and the location changes? When to fish depends on what kind of fish you are after. Paddlefish are in the fall and require a special permit. Catfish are best after the runoff is gone. Carp can be fished anytime. They are all fight, but most people won’t eat them. They are kind of practice fish. They are an invasive nuisance fish. In Montana, we have limits that help keep healthy fish populations. Fish are not caught during spawning season. Fish that are too small must be put back. Fish populations in each area are studied. If there is overpopulation, there will be a 5 fish per day limit. If there is a healthy population, there is a 1 fish per day limit. The limits vary for each body of water, and at different times of the year. 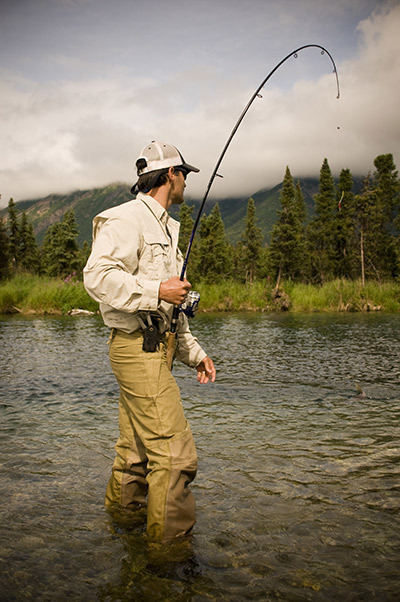 In the spring, there might be a high limit, then as the water levels drop in the summer heat, they may suspend fishing to prevent the stress on the fish. It is a very changeable. For me fishing can be relaxing, but the biggest challenge is not diving in to swim! Fishing can be as simple as a cane pole and a worm or as complicated as studying when bugs hatch and how high streams are flowing. I vote for starting simple…getting the hang of it and advancing slowly.